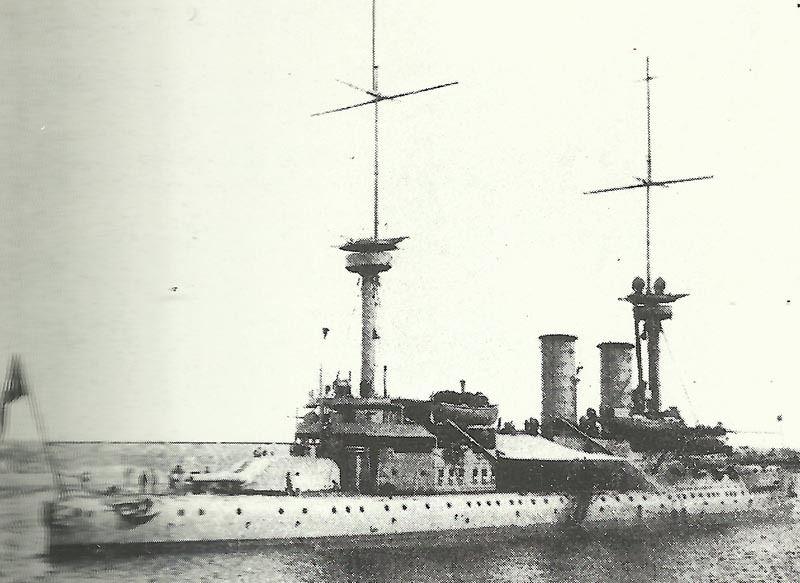 Pre-Dreadnought ‘Turgut Reis’, the sister ship of the sunken ‘Haredin Barbarossa’ (ex-German ‘Kurfürst Friedrich Wilhelm’) built 1891 and 9,901 tons displacement and 4 x 11 inch guns as main armament. Dardanelles: Turk battleship Heirredin Barbarossa sunk by British submarine E11 (Nasmith) south of Bulair, which also sinks 2 transports and 2 ammo ships until August 15. E14 torpedoes Turk steamer which beaches. North Sea: Armed Merchant Cruiser India torpedoed and sunk by U22 off Norway. Baltic: First German attempt (including High Seas Fleet ships) attempt to penetrate Irben Straits (Riga) fails with 3 minesweepers and cruiser Thetis mined. Poland: Germans occupy Warsaw Praga suburb, Novo Georgievsk fortress cut off. Gallwitz fights Battle of Ostrov until August 10, takes Lomia on August 9. Mackensen forces Russians east of river Veprj. Gallipoli – Suvla bridgehead: Stopford finally lands, Hamilton arrives at 1800 hours to stir advance inland. Anzac bridgehead: NZ Wellington Brigade captures Chunuk Bair summit. South Persia: 300 British occupy Bushire on Gulf, take and demolish Dilbar fort and village (August 12-16), 26 miles away. South Cameroons – Action near Njabesan: c.300 British retreat down river Campo (until August 11), but reinforced resume operations on August 19-30. Italian Front: Italians bomb Monfalcone dockyard (d’Annunzio flies first operation mission in 4-crew seaplane bombing raid on Trieste on August 7). Germany: Peace overtures to Russia via Denmark fail, with Tsar’s third refusal from August 3.